When Tom Scioli visits Phantom of the Attic Comics on South Craig Street, it looks different than what he remembers 25 years ago. In the ’90s, its walls were lined with superheroes, avant-garde art and daily life comics, while now it focuses on handmade comics by local, niche artists. To some, the illustrations and stories lining Phantom’s walls in the ’90s were just pop culture and late-night casual reads. To Scioli, a Pitt student at the time, they were the inspiration for his own comics. 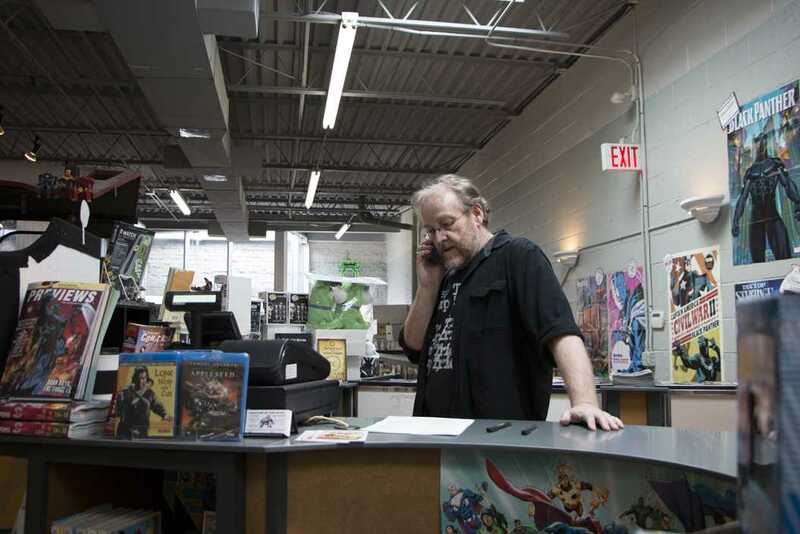 Shops like Phantom are at the heart of Pittsburgh’s growing comic book scene, and the change to the content housed inside is a sign of how Pittsburgh’s local comic culture has expanded. The city’s combination of low-rent properties and high concentration of artists caters to the lifestyle of comic book artists and illustrators. Between the variety of storefronts as well as events and expos celebrating independent comics, artists are moving to Pittsburgh to make their comics come alive, building a tight-knit community along the way. This year’s sixth annual Pittsburgh Indy Comix Expo, a day-long expo featuring local and independent comic artists, was held at the August Wilson Center for African-American Culture in the Cultural District April 9. In addition to showcasing the work of smaller artists, the expo — which was free to the public — held panel discussions and lectures about handmade comics and illustration techniques. Comic fans could also take guided tours of the ToonSeum across the street, one of three museums in the United States committed solely to comics, illustrations and cartoons. The Pittsburgh Zine Fair, which started in 2011 and held its winter market in December, caters to a slightly wider audience. Zines, short for magazines, are self-published works, including artist-created comics, with limited local circulation. Black-and-white zines dominated the creator-owned comic scene in the 1980s, when Phantom of the Attic sprouted up in Oakland in ’83. Now, Pittsburgh’s comic scene has broken into artists who specialize in specific subjects — Michael Pisano’s zine about bugs and fungus, for example. Carnegie Library’s zine section in Oakland — a corner of the library’s first floor — holds local zines and comics on a smattering of topics. Among them is Jessica Earheart’s Land|Scape, a series of landscape collages juxtaposed with haikus that explore environmental crises, and Cowboy House, a Pittsburgh-based art collective that addresses themes ranging from science fiction to children’s zines. Scioli, a prominent member of the comics community, came to Pitt’s art school in 1994. He and other students made content and distributed it through zines, just as students today use the rest of their Pitt printing quota to self-publish comics, poems or even recipe books. For example, Pitt’s student radio station, WPTS puts out a zine with opinion pieces, articles and artwork about music. Scioli has been in the Pittsburgh comic scene since distribution transitioned from small-scale DIY zines to webcomics reaching thousands of people. Scioli himself has taken advantage of the rise of webcomics with “American Barbarian,” his original sci-fi epic tracking main character Meric on his quest for revenge in a “post-post-apocalyptic world.” Scioli released the story through his website beginning in 2010, to a wider audience at a lower cost. IDW Publishing, the company that put out Scioli’s “Transformers vs G.I. Joe,” saw the success and acclaim of Scioli’s online work, and published the full “American Barbarian” collection in hardcover format in 2015. Scioli recently started the weekly web comic “Princess,” which follows an alien-fighting space princess. To most older artists, web comics have changed the game. Even though Scioli says color is a main component in his work, in the past, only large comics companies could afford to use color and independent creators were left to a limited medium. Younger artists use web comics to distribute independent work as comic giants like Marvel and DC become bigger than ever. Theora Kvitka, a 29-year-old comics creator and student pursuing a Master’s degree in interactive design at Carnegie Mellon University, is one of these artists, finding a moderate internet audience through Tumblr and her blog. Kvitka moved from Chicago to Pittsburgh in August 2016, but she began regularly making comics in 2012. She started posting “Urbanity Planet” — a narrative web comic following recent college graduates who can’t afford to live on Earth anymore — in January 2016. “Since there’s only one of me and a lot of different festivals and venues, online [platforms] will be necessary,” Kvitka said. Scioli said carrying an audience from project to project is one of the pitfalls of publishing online, since it’s difficult to get people to care about a creator’s next project. Scioli left webcomics to pursue more formal work with DC and Image but has returned to the internet after growing tired of close deadlines and tight page counts in the more formal comic book world. When “Princess” went online Feb. 8, people were reading it the same day— Scioli said he feels reinvigorated. Despite the ubiquity and unlimited potential topics of web comics, brick-and-mortar stores such as Phantom remain central to community-building in the comic scene. Phantom of the Attic Comics was originally a chain of five stores, though today only three survive — in Oakland, Greentree and Monroeville. Phantom of the Attic Comics in Oakland occupies a second-story space above Top Notch Art Supply, with no storefront on the ground level. A word balloon announces “New Comics Wednesdays at 1 p.m.!” informing passersby of new weekly shipments from the “Big Two” publishers — Marvel and DC — as well as smaller or independently published comics. Inside, Wayne Wise — the self-proclaimed “behind-the-counter-guy” — mans the wrap-around desk in the center of the store, sporting a full gray beard and glasses, always ready to chat. He’s been with Phantom since 1997, but among the full-time employees who consist of the owner and a handful of others from the mid-80s, Wise is still the new guy. Straight back from the top of the staircase is a local creators shelf. Between the manga and the independent collections, this shelf houses works like Scioli’s “Godland,” Jim Rugg’s “Street Angel,” and Ed Piskor’s “Hip Hop Family Tree.” Even with this variety of cosmic drama, urban fantasy and culture study, it doesn’t scratch the surface of what Phantom has to offer. “I think we have our identity, but we also kind of carry a little bit of everything,” Wise said. “Everything” ranges from Marvel’s “All-New, All-Different Avengers” series to Brandon Graham’s independent and abstract “Island” anthologies. Scioli takes in a little bit of it all with every visit. Scioli started walking to Phantom during his years at Pitt and hasn’t stopped going since. “I was just a guy with an art degree that wanted to tell a story,” Scioli said. According to Scioli, new artists come to Pittsburgh regularly to create art and dive into the comics culture. Kvitka said many artists come to Pittsburgh as an affordable alternative to sprawling big cities. She attended both the Pittsburgh Zine Festival in December 2016 and the Pittsburgh Indy Comix Expo in April. In-person gatherings are where she connects best with her readers. Kvitka’s goals include finding a sustainable audience — both online and at comic gatherings — and getting published. “It would also be great not to self-publish and have someone else do the heavy lifting for me,” Kvitka said, noting that she’s also responsible for marketing herself. When Scioli first began self-publishing, he found a lifeline in small stores such as Phantom. At the time, however, Pittsburgh’s comic scene was relatively small, which allowed up-and-coming artists a certain degree of visibility in the community. According to Scioli, Pittsburgh has a relatively unified group of comic creators focused on these shops. It’s a melting pot of interests, but most of the artists have one thing in common: a desire for creative independence.